Worried about brain fog at menopause? Exercise is known to help but what is best for your brain as well as your body? We know that exercise is good for your health. The benefits range from reducing risk for heart attacks to improving the long-term outcomes for condiions including with depression. We know it, but don’t always follow it through and while exercise offers many physical benefits, scientists are also interested in how regular physical activity can fundamentally change the brain, especially when it comes to disease and aging. A recent study on mice, published in the journal Nature Medicine, found that a hormone released while exercising may improve overall brain health and mitigate the damage and memory loss associated with dementia. Makes sense to me, and it does raise questions for future research of how different forms of exercise might impact the brain. So here are five ways that current research suggests different kinds of exercise may affect the brain. In a 2016 rodent study, aerobic exercise like running was associated with the creation of new brain cells in the hippocampus, the part of the brain dedicated to storing memories and forming new ones. This exercise can also positively affect the health and function of the synapses between neurons in the hippocampus, improving communication between brain cells in the area. In another experimental study, this time in humans, 28 young and healthy students engaged in an aerobic running programme. The exercising group of students had a significant increase in spatial memory performance and positive feelings and emotions, compared to the non-exercising control group. Two benefits in one, and definitely not confined to the young. One study found that in blood flow to the brain increased in those who exercised on a stationary bike, another form of aerobic exercise. The increased blood flow was linked to mechanisms responsible for cell growth and improvement in brain function. Personally I don’t have the balance to be safe on a bike on the road any more, nor do I want to be exposed to all that traffic so a stationary bike is a much healthier option for me. A 2018 pilot study investigated the effects of both movement and breathing-focused yoga practices on stress and attention span in university students. The study found that participants of both practices exhibited a reduction in perceived stress. Interestingly, only the breath-focused yoga group showed significant improvements in their sustained attention so you don’t necessarily have to do yoga, though it is a great physical practice, as mindfulness mediation would have the same benefits through breathing. 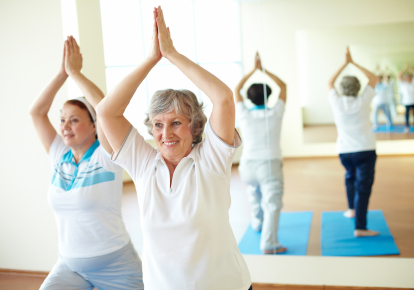 Strength-training, aerobic exercise, yoga – all of these forms of exercise led to improved cognitive performance in older adults (average age: 73) both with and without cognitive impairments. The research found that exercising for at least 52 hours over the course of around six months offered benefits to the brain, whether it was just one of these modes of exercise or a combination of the three. At the end of the day, it isn’t hugely important whether you prefer weight training, running, or doing yoga. The benefits of incorporating any kind of exercise into your life, especially for the brain, far outweigh the benefits of not exercising at all. Brain fog at menopause is common, and helped by bioidentical progesterone but exercise can also reduce the risks associated with common lifestyle diseases that impact the brain, such as high blood sugar and hypertension.